Meet Izzy! 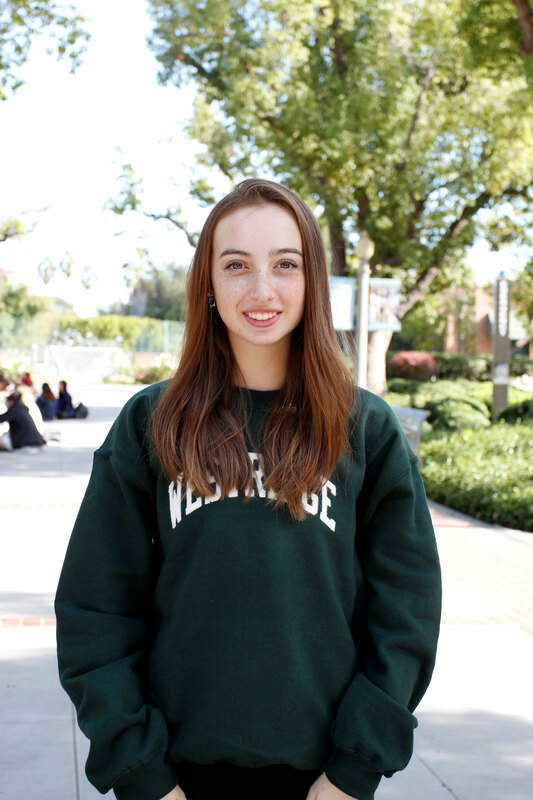 She's a junior at Westridge, one of our Admission Ambassadors, and a founder and head of Middle Eastern Affinity. Learn more about her in this Q&A. I came to Westridge in 7th grade from a co-ed school. I wanted an environment where I could feel more confident talking in class. I didn’t feel very confident in my co-ed school and I think it was because boys were always dominating the discussions in class. As soon as I walked on campus at Westridge, everyone was so welcoming and it felt very inclusive. In Middle School here, I became way more confident and there were so many opportunities to participate in student government and clubs that I actually became the 7th grade class vice president and 8th grade class president. I spoke at Open Houses and gained courage to talk in front of people, and the faculty, staff, and students have always been there to support me no matter what. How was your transition from Middle School to Upper School? For me, it was really smooth! I think in 8th grade, they prepared us a lot for high school. Especially in English, I felt really prepared because of all the in-class analyses, annotations, readings, discussions, and projects that we did in 7th and 8th grade English. All of that helped prepare me for the intensity of the classes and types of discussions we would be having in Upper School. What is your favorite part of being at a girls’ school? Not having the distraction of boys! I also feel like I have more confidence to raise my hand and participate in a class discussion, even if I might be wrong. The students here are so supportive and I feel so safe on campus. I feel like I can be who I am and not have to act a certain way because there are boys around. What is/was your favorite class at Westridge? Anything science-related! Anatomy & Physiology with Ms. Hatchman, which I’m taking this year, has been my favorite class. I want to be a plastic surgeon, so I love studying human anatomy and Ms. Hatchman is absolutely brilliant. I love her. It’s such a fun class! In Middle School, I loved 8th grade math with Mr. Cook. He had such a great way of teaching; it was a very hands-on class, and there were also opportunities for us to teach the class ourselves! There were a couple of projects where you would be partnered with someone and you both would lead a class or teach a lesson, and I had so much fun doing that. I feel like I was able to better understand the materials through doing that because you have to be really prepared! It was great to gain a deep understanding of math right before high school. What is one thing you wish you had known before coming to Westridge? I also think that whatever your background is, you’re going to find a group like you here; you’ll find people with the same religious background or culture, and there are so many affinity groups that exist for exactly that reason. I’m a founder and head of Middle Eastern Affinity and I’m also in Christian Affinity. It’s so nice to have groups where you can talk about the traditions you share and discuss more serious issues that affect you all. You never feel alone. Why do you recommend Westridge to other girls? I recommend it to families and their daughters because it’s a place where girls can really flourish. Whether it’s academically, athletically, or in courage – they’re going to absolutely bloom here. You can create your own pathway and your own story, and you feel truly empowered. If you come to Westridge, you know you’re going to get what you signed up for! What do you think makes Westridge “Westridge”? The environment is so unique. When I was applying to schools, the environment at Westridge really stood out to me. Everyone wanted to get to know you even if you didn’t end up applying here. It’s a community that wants to be there for you.